The Resident Tourist: Brew York City . . .
Last time I was in Dallas we went beer tasting at this really neat spot called Craft and Growler. If the name doesn't already give it away, it's a craft beer bar that also acts as a filling station. 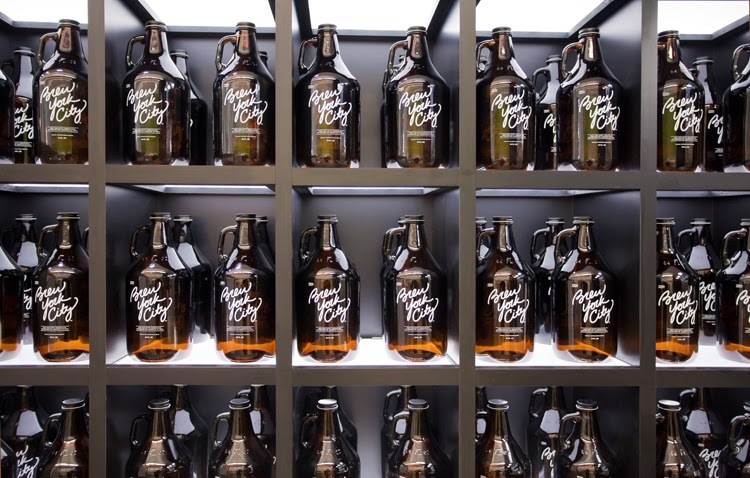 After sampling a slew of unique beers, you can buy or bring your own growler to fill up to bring some of those unusual brews back home with you. I was totally into it and determined to find a similar concept in NYC. Fast forward to a week later... I was picking up some toothpaste at Duane Reade and you won't believe what I saw: Brew York City. Maybe I'm a bit behind the times on this one, but did you know that Duane Reade has its own growler station? I was shocked and intrigued to see a beer bar in a pharmacy. I would have never thought that my search for a New York growler bar would end right there at Duane Reade. So here's the deal: There are four DR locations in the city with Brew York City bars (two on the Upper West, one in Union Square, and one in Brooklyn). You can take your own growler for filling (I love these West Elm ones) or purchase one on-site. If you're curious what beers each location is featuring, check out an updated list on BeerMenus. Also, stop by your nearest location to find out when they have complimentary beer samplings. Talk about two birds with one stone. Craft beer and toothpaste all in one trip, I was instantly sold.